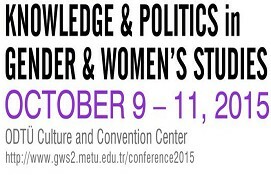 We are pleased to invite you to the International Conference on Gender and Women’s Studies, which will be held in Ankara, Turkey on 9-11 October 2015, organized by the Gender and Women’s Studies Graduate Program at Middle East Technical University. This Conference identifies several themes for critical inquiry and creative engagement in gender and women’s studies and related interdisciplinary fields in social sciences and humanities. Please submit your abstract in English up to 250 words, along with your name, institutional affiliation, telephone, email address and your short bio (max. 100 words) to the conference website at www.gws2.metu.edu.tr/conference2015, by 11.59 pm on June 20, 2015. Late submissions will not be considered. 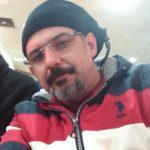 Limited number of presentations in Turkish will be accepted. Please mark the checkbox about the language presantation in registration form. Each submitted conference paper will be blind peer reviewed by three competent reviewers. There will be no fund for accomodation and traveling expenses for participants. Please take the time to explore the website [www.gws2.metu.edu.tr/conference2015] for more details, to check on important dates, and keep yourself up to date on recent changes. The Gender and Women’s Studies Graduate Program at Middle East Technical University (METU) started in the 1994 – 1995 academic year. In order to celebrate the program’s twentieth year we would like to invite you to the International Conference on Knowledge and Politics in Gender and Women’s Studies. The main objective of the conference is to provide a platform for discussing the formation and development of gender and women’s studies over the last 20 years and the future of the discipline both in Turkey and globally. We would like to reflect on the theoretical and discursive scope of this interdisciplinary field as it addresses problems both universal and local, as well as the obstacles to its advancement. The second objective is to facilitate cross-generational encounters between those that have pursued their studies in this field and build bridges between them. Situated in a global movement, three generations have perpetuated studies in this field in Turkey. The first generation pioneered feminist studies from a Turkish perspective, helping to frame the discipline of women’s studies in the 1980s and early-1990s. As the students of the first generation, the second generation integrated themselves in the academy during the 1990s and 2000s. As for those forming the third generation, they are now carrying out their graduate studies within the field. Gender and Women’s Studies is a relatively new but increasingly flourishing discipline, not only in terms of knowledge but also political engagement. In order to support this discipline which contributes to social thinking and theoretical studies in so many critical ways, we believe in the importance of strengthening intergenerational relations and forming networks that embrace all of us. We have thus planned this conference so as to serve these two purposes, offering opportunities for evaluating the past 20 years and for mutual sharing of experience among the generations.